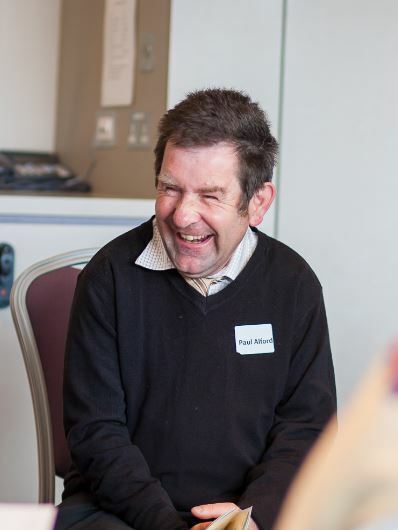 Paul Alford presented at our workshop, The Freedom to Choose: Contracts, Capacity and the Law recently and shared his story about moving from an institution into his own apartment. Paul is paired with Michelle Browning who is currently completing her PhD at the Living with Disability Research Centre, La Trobe University in Melbourne, Australia. My name is Paul Alford. I want to share a story about moving from an institution to my own apartment. My 7 word autobiography is – traveling, working, speaking-up, living independently, music & Elvis, football. I joined the VOICES project because I thought it would be good to tell my story. What was your favourite part of the first workshop? My favourite thing was getting to know the people and working with them to tell my story. What are you hoping to learn from the project? I am hoping to get a lot of feedback from my story and hoping it goes well.